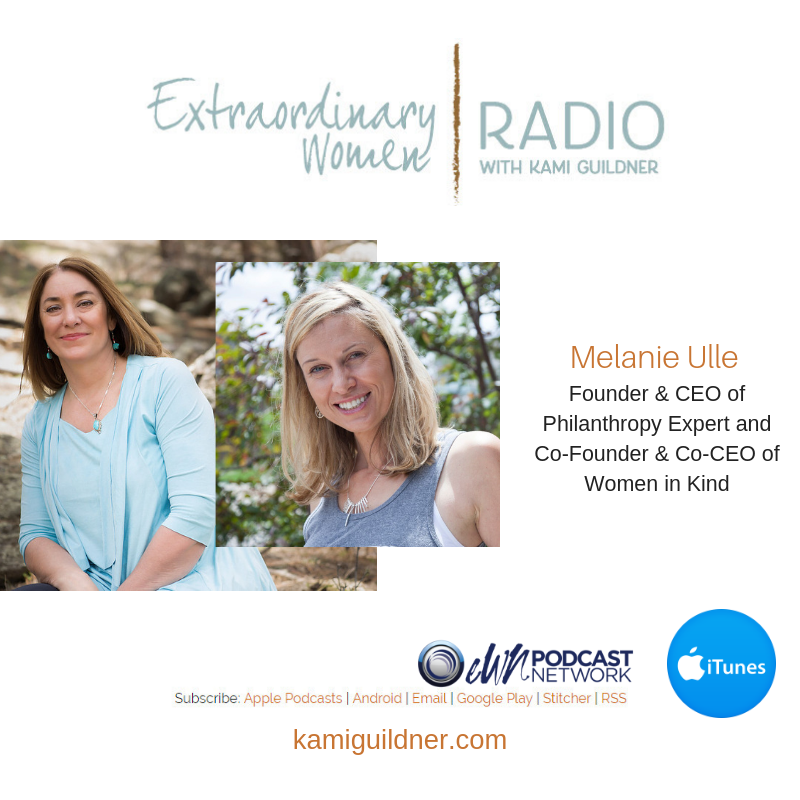 Today’s Extraordinary Women Radio guest, Melanie Ulle is the founder and CEO of Philanthropy Expert, LLC, a Denver-based philanthropic and nonprofit consulting firm. Melanie was recently named to the Colorado Women’s Chamber of Commerce 25 Most Powerful Women in our state! Mel started going door-to-door knocking on doors for politics when she was only 8 years old! She was born to make a difference in our world! Sparked by the election in 2016, Mel shares the story of how she and her business partner Ginna Santy founded Women in Kind, a co-working community in Denver – designed by women and for women. Together they raised capital for their vision and stepped into the dream to create a fabulous entrepreneur community supporting women. Mel’s life has been filled with adventure and powerful personal and professional stories that has truly sparked an extraordinary life. She’s stepped in courage, healed from tragedy, and she will inspire your own journey. We jam about empowering women, #MeToo, spiritual guidance and the rise of women showing up in the political scene. Melanie’s professional work has spanned twenty years with a keen eye on organizations supporting women including the Girls Athletic Leadership Schools, female candidates for elected office, the Center for Women’s Health Research, the Women’s Foundation of Colorado – an organization that’s very near and dear to my own heart, and many women’s health initiatives and empowerment programs. Melanie has received attention in media outlets locally, nationally and throughout the world including: the Today Show, Martha Stewart Show, Fox News, the New York Times, the LA Times, the Washington Post, Wall Street Journal and dozens of other publications. To learn more about Melanie Ulle, you can follow her on her web sites: www.womeninkind.com, www.philanthropyexpert.org or follow her on Facebook or LinkedIn!